wow, your arm looks damn good. My very first post had my first 'hearts tatt on Sunday (2nd Tatt overall) ok lets see if it'll let me post some pics...here goes ..no ? ok help, how do I post pics on here? My Smileybones that I had drawn by Ginger, love it. Getting more Wildhearts ink done soon, properly start on my arms. 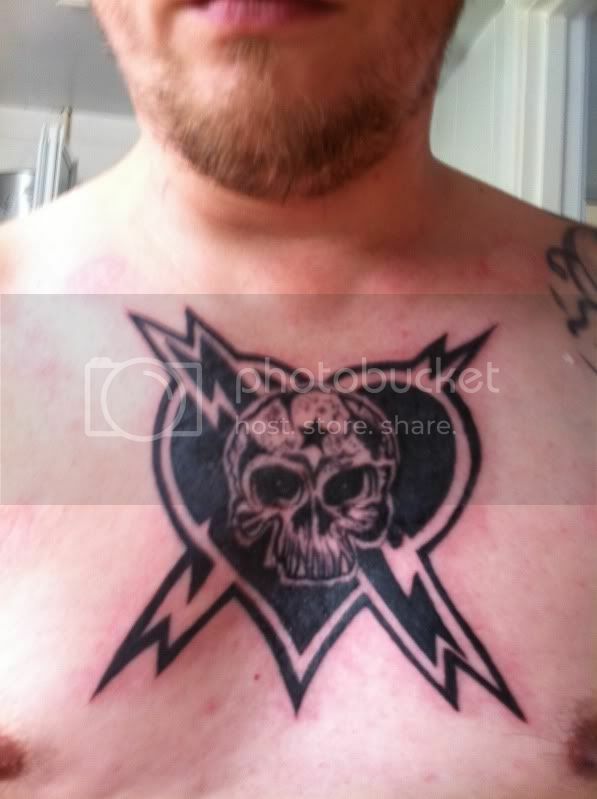 The other half's Wildhearts contribution to the tattoo world. It's rather shapely here as it was just inked and swollen, my phone's decided it won't upload a newer photo. I won't find no future by fixing the past! That's a pretty neat Riff After Riff tattoo. I've got to ask the predictable question - what does it feel like being tattooed there? I don't have much flesh before the breastbone so imagine it would jar somewhat. I also find that the area that's been tattooed hurts more after the process rather than during - maybe that's just me. Was definately the most uncomfortable tattoo I've had done yeah, and I've had quite a lot. Got this bonnie lad on my arm on Saturday courtesy of Lorraine at Bodyline Tattoo in Glasgow. Delayed Christmas present to myself.